An early scene in Rajshri Productions’ Prem Ratan Dhan Payo gives us an indicator of the ancient values this film seems keen to propagate. Yuvraaj Vijay Singh is meeting journalists in the run-up to his ascension to the throne of his kingdom. A bemused newsperson asks him about the appropriateness of the ornate coronation ceremony in this modern world. It’s almost funny, says the man. “You think traditions are funny?” an affronted Yuvraaj shoots back softly. His offended tone is genuine. I could almost picture the gentle-voiced, quaintly conservative writer-director Sooraj Barjatya throwing precisely that question in precisely that tone to a critic bemused at the extreme conservatism of his latest film. It would be a genuinely felt question because Sooraj – as I gathered from a long interaction I once had with him – is actually convinced of the purity of the regressive scenarios he portrays in his films. The director of megahits Maine Pyar Kiya (MPK), Hum Aapke Hain Koun…! (HAHK), Hum Saath-Saath Hain, Vivah and the not-so-successful Main Prem Ki Diwani Hoon returns to the big screen after a 9-year gap with Prem Ratan Dhan Payo. This Salman Khan-Sonam Kapoor-starrer lacks even those few qualities that made his earlier ventures bearable for folk like me who find his settings and worldview unbearable. MPK, for instance, had sweet songs and a Salman whose youthful innocence somewhat compensated for his acting inadequacies. HAHK had Madhuri Dixit’s electric pizzazz, peppy numbers and the novelty value of 14 songs in a single film even for an India bred on musicals. Vivah had emotional heft – I guiltily confess that I sobbed through it, despite being conscious of how conformist, maudlin and melodramatic it was. Prem Ratan Dhan Payo (PRDP) has none of the above. The story is dull. The songs – usually considered a Rajshri USP – are an utter bore. Twenty-six years after he debuted as a hero with Sooraj’s directorial debut MPK, Salman’s shot at a double role in PRDP merely highlights his limitations. That trademark charming goofiness fails him here – he seems to be trying too hard. Playing his fiancé, Sonam Kapoor is as stunning and stylish as ever but it’s hard to look beyond the fact that she looks young enough to be Salman’s daughter. Coming as she is from the box-office success of Khoobsurat in 2014, at a stage when Hindi filmdom is offering marginally less limiting roles to its heroines, it is just as hard not to wonder why she saw this baap-beti romance as a positive stamp on her CV. The talented Deepak Dobriyal and Swara Bhaskar too are sinfully wasted here. The only one who comes off looking good is Neil Nitin Mukesh, an under-rated actor who really really deserves better than this film. In short, PRDP is insufferable. The lacklustre story is set in Pritampur, where Rajkumari Maithili (Sonam) is set to join her fiancé, the Yuvraaj (Salman), for his crowning. Before her arrival, an accident brings into the royal fold a doppelganger, Prem Dilwaale (also Salman), and his sidekick Kanhaiya (Deepak Dobriyal). Prem is a small-time actor and Ram bhakt from Ayodhya. Also in the picture are a loyal Diwan (Anupam Kher), the prince’s estranged half sisters Chandrika (Swara) and Radhika, his half brother Ajay (Neil) and Ajay’s sneaky lieutenant Chirag Singh (Armaan Kohli). 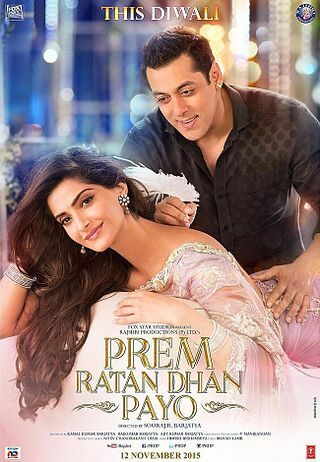 That the story and storytelling style are tedious is not PRDP’s only problem. That the setting is feudal and patriarchal is not the problem either. The problem is that the director glorifies and romanticises every feudal, patriarchal, backward practice portrayed in this yawn-inducing film. Take for instance a flashback during which Diwansaab explains the tension between the Yuvraaj and his sundry siblings. Apparently the dead Maharaj (Sameer Dharmadhikari) had a wandering eye. An affair (or was it an nth marriage?) with a singer resulted in two daughters. In their childhood, the many fruit of the king’s loins all sang, danced and played together in pretty clothes in a Sheesh Mahal above a waterfall, in the way humungous joint families have all sung, danced and played together in every Sooraj Barjatya film so far. The king’s philandering is passed off casually by the man himself as his “kamzori (weakness)”. The ensuing rifts, on the other hand, are blamed on auraton ke jhagde (women’s fights). How dare these stupid royal chicks expect monogamy or fidelity from their spouses, no? To ensure that no one in the audience is left with any doubt about a woman’s place in the world, the Rajkumari says at one point in response to Vijay/Prem’s request for her cooperation in one of his schemes: Jaise Ram chahenge, Sita karegi (Sita will do what Ram wills). It is no coincidence that she is called Maithili, one of the many names of the Goddess Sita who is considered by some to be the epitome of unquestioning wifely obedience in the Hindu pantheon. Elsewhere, the writer makes what I suspect is an effort to prove his progressiveness by giving us an extended sequence involving a horny Maithili begging Vijay/Prem to do the deed with her. That situation could have led to a discussion on the complex issue of consent, since at that point Maithili thinks she is dealing with Vijay and does not know of Prem’s existence. But to attribute such layered feminist writing to PRDP would be to give more credit than is due to a film that thinks women would naturally be lousy at football, that men would be naturally good at it (sports ke maamle mein ladies logon ko kuch kuch hota hai, you see!) and thinks it is being ultra-cool by including one feisty female football player in the story. Frankly, spending so much time writing such a long review is in itself giving more credit than is due to this half-baked, lifeless, low-IQ film with its juvenile humour and family politics that resembles circumstances in the cheapest saas-bahu soaps now running on Hindi fiction TV. The Diwali Dhamaka that turned out to be a Dud! Thank you for this honest to goodness review. Completely agree, I didn't think it deserved a long review either. I liked Vivaah too for its emotional upheaval. In that it had a demure and soft spoken leading lady, but her characterization was very good. Here Sonam just looks out of place as demure. And you can really see that Barjatiya wanted her to be subservient in every way, including her voice.